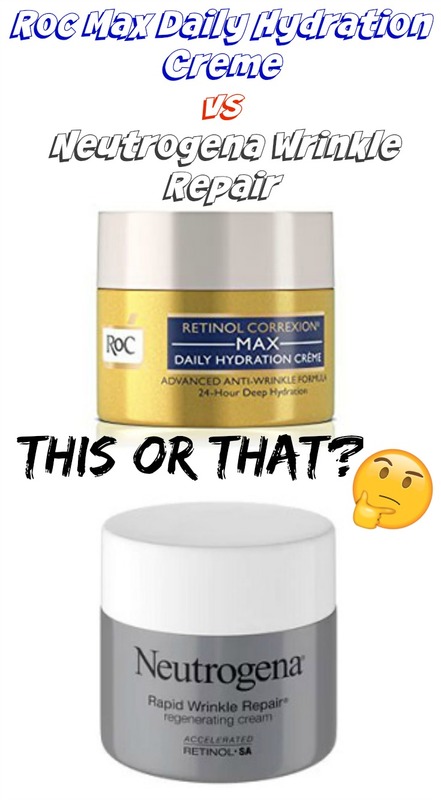 Roc Max Daily Hydration Creme vs. Neutrogena Rapid Wrinkle Repair: THIS OR THAT? I have tried them both: the Roc Max Daily Hydration Creme and the Neutrogena Wrinkle Repair cream. Besides that nobody can probably remember both of the names- haha -they have in common that they contain Retinol. So, which one performs better? Reveal younger-looking skin and visibly reduce wrinkles with RoC Retinol Correxion Max Daily Hydration Crème. This intensive anti-aging cream is clinically proven to reduce wrinkles in one week with continued improvement each week thereafter. 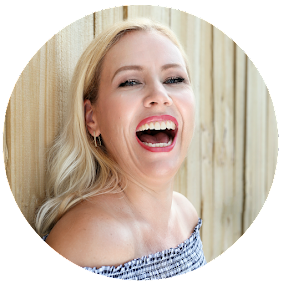 It delivers smoother and more radiant skin after one week, smooths eye wrinkles after four weeks, and visibly reduces deep wrinkles and dark spots after eight weeks. Neutrogena Rapid Wrinkle Regenerating Face Cream regenerates visibly younger-looking skin in just one week. Rich moisturizing cream delivers the highest concentration of Accelerated Retinol SA deep into skin's surface quickly and effectively, for visibly smoother and younger looking skin in just 1 week. Accelerated Retinol SA is the fastest retinol formula available. Do you see, how similar the claims are? Both claim to provide: younger-looking skin in just one week and to deliver smoother skin in one week! (Personally I find the claim not justified for both creams, please give it at least 4 weeks to see first results with a retinol cream). The consistency of both products feels the same to me: they are moisturizing well and are easy to apply without feeling heavy or greasy. The Roc cream has a light yellow color to it, while the Neutrogena cream is white. But the color does not really matter. No winner here! Both products smell very nice- I would say the Neutrogena smells a little lighter and fresher, while the Roc smells a little deeper and more "perfume-like". If I would have to guess, the fragrance of the Neutrogena is made for younger folks while the Roc is made for mature women, yeah which I realize sounds a little stupid. Cause I don´t think that our age defines what kind of fragrances we like- but I am guessing that is what THEY think of us. LOL! So, no winner here. Depending on the retailer they cost both about the same- something between $25-$28. So you might be able to save a couple dollar, if you are looking, where it is offered at a lower price. However, since they are in the same price range, we have no winner here. OMG, OMG, OMG! See that? The ingredients are almost completely identical!!!! To be honest: I completely expected that already, because when I tried both of the creams, I was already thinking to myself: Hey these 2 creams perform actually exactly the same! LOL!!! So, overall, which one is the winner? Well, in case you haven´t noticed: I think they are almost exact dupes, it really doesn´t matter which one you choose. Like I said earlier: the Neutrogena smells fresher and cleaner and the Roc more "perfume-like"- so that is up to your preference. Both are winners. Both contain Retinol and will help to smooth out wrinkles. However, if you have sensitive skin, I recommend the new fragrance free version of the Neutrogena Rapid Wrinkle Repair Cream.